Moms are superheroes, but a superhero needs a special weapon. When you're a mom, ensuring everyone's health and safety, especially your kids, is top of mind. From day one you'll want to have a well-stocked medicine cabinet or medicine bag (which can be stored out of reach and is portable) so you can quickly deal with the sniffles, fevers, and other common ailments that toddlers are prone to, as well as a nebulizer if you're dealing with asthma attacks. When your toddler experiences a full-blown asthma attack in the middle of the grocery store, you may want to use your special weapon. After spending nearly a year searching for the best nebulizer for my kids, I've finally found one! Yay! Check out Omron's CompAir Nebulizer System. It is the smallest, lightest, most convenient tabletop nebulizer ever. The CompAir nebulizer system offers an affordable and efficient alternative for patients experiencing asthma, COPD or other respiratory conditions, allowing you and your family to breathe easy. A room full of supermoms! Omron Healthcare brought together influential Mommy Bloggers for a special treat at Stacy’s Bonifacio Global City. Such a joy when you are all in the same industry, understand each other's daily woes, joys, and concerns, then discover a new and amazing product. Omron Healthcare aimed to create an awareness campaign on the availability of efficient medication for asthma and chronic obstructive pulmonary disease (COPD) in the market. Many moms are plagued with the challenging task of managing their kids’ respiratory issues and Omron Healthcare wanted to let them know that they are a valuable partner in helping moms deal with these concerns. We were engaged all throughout the day, starting with the talk of Dr. Anjanette O. Reyes - De Leon in the morning followed by a sumptuous lunch and a quick demo of the product in the afternoon. Dr. Anjanette O. Reyes - De Leon, M.D., Pediatrician and Asthma and Lung specialist. Dr. De Leon shared valuable information about respiratory problems, management and cure, which moms need to know to effectively help care for their kids dealing with such issues. 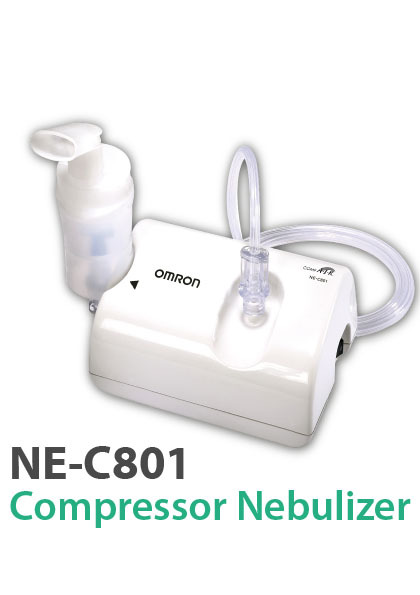 Omron Healthcare also showcased the CompAir Nebulizer System NE - C801. The NE-C801 Compressor Nebulizer system was developed for the efficient management of asthma, chronic bronchitis, allergies and other respiratory disorders. This Omron nebulizer kit uses Virtual Valve Technology (V.V.T.) which provides highly efficient nebulization with reduced medication wastage. The compressor forces air to the nebulizer kit. When the air enters the nebulizer kit, it converts the prescribed medication into an aerosol of microscopic droplets that can easily be inhaled, helping patients to breathe easy faster. It boasts of an efficient nebulization rate of 0.3 ml/min. What I really love about it is that you can easily carry this nebulizer anywhere as it is compact and lightweight. It is likewise extremely convenient, easy to use and clean anywhere. Its child-friendly design and silent operation make it ideal for use with your kids who may get scared of bulky and loud nebulizers. Omron truly aims to give every Filipino the best there is to offer. Patients can now #BreatheEasywithOmron. But the best offer doesn’t end there! Get easy breezy with the Omron Healthcare price cut off promo. From Php 3,280.00, you can now get Php 300 off when you purchase the Omron CompAir Nebulizer System NE - C801 from all leading drugstore chains, appliances store as participating dealers of the promo and infant stores from September 15 to October 31, 2017, per DOH-FDA Permit No. CDRRHR-0121 series of 2017. Thank you so much, Omron Healthcare, for bringing together all these amazing mommies on a relaxing Wednesday afternoon. This discerning bunch is grateful for all the awesomeness that goes into your amazing CompAir Nebulizer System. For moms out there who are looking for a perfect nebulizer, check this out and enjoy Omron's best deals! For more information, please visit www.omronhealthcare.com.ph. For updates on the latest activities, promotions, connect via Facebook.com/OMRONHealthcarePH/.